One thing's for sure - we've heard a lot of noise from the Indian IT services mammoths over the last five years that they are going to grapple with the likes of Accenture and IBM to become billion-dollar BPO giants. And while Cognizant, Infosys, TCS and Wipro have all made progress developing sizeable BPO businesses, none of them have yet come close to surpassing the size and scale of pureplay Indian BPO leader, Genpact's $1.5bn turnover. Why is this? Developing BPO footprints requires cementing relationships beyond the walls of the CIO's office. One of the reason's for HfS' success, is our ability to communicate with business function leaders, in addition to IT leaders. This involves understanding and lending value to supporting the business function issues and processes that impact finance, procurement, supply chain, HR and other operational areas. Most of our research competitors are firmly rooted in IT-land and have not invested in personnel that can open communication channels to support the business functions - and most never will. It's similar for the Indian IT services firms, as they seek to push business-process led solutions, often enabled by IT, into their clients. While many initially began their forays into BPO by attempting to reach business function leaders through their IT relationship, most have realized that they need a more direct line into the business function than tenuous introductions from the VP of CRM apps. They've realized they need to make significant investments in domain-specific personnel (with real process experience) both onshore and offshore, to create awareness and open communication channels, in addition to the scale they need to take on business. They're also realizing they need patience to convert clients and often start with much smaller engagements and make margin sacrifices. So let's take a closer look at one of the up-and-coming Indian firms that's made a concerted effort to build a top-tier BPO business over recent years: InfosysBPO, who recently invited us, and several other industry influencers, to partake in their anual BPO client event, named "Colloquium 2011". InfosysBPO is now a major BPO contender in the global marketplace. Infosys has quietly gone about building its BPO business streams since its inception via the buyout of FAO provider Progeon, exactly five years' ago and expects to reach the landmark of $500m in revenues this year. HfS has always been encouraged by the firm's approach to developing both horizontal and vertical BPO services, and its focus on leveraging its IT heritage to augment its value proposition. Infy is by no means the biggest player in the BPO business nor does it want to be, but it has been able to establish itself as a smart and very respected player in the BPO business. Overall, it has shown the rest of the industry how to grow profitably and maintain above-industry growth performance. Last fiscal, it grew its business from $352m to $427m, while maintaining operating margins in excess of 20% - the best growth performance than the rest of the BPO market. We believe it has also established strong positions in the retail and consumer products, banking, insurance and manufacturing industry verticals, in addition to the horizontal BPO areas of analytics, sourcing and procurement and finance and accounting. Its open culture creates greater customer loyalty. Infosys has consistently been one of the most open BPO firms for introducing its customers to each other and instigating open and transparent dialog with industry influencers. Attend any of its BPO customer events and you'll be surprised by the refreshing openness of the dialog where customers air their operational issues in an open forum and have practical discussion with their peers to share their best (and worst) practices. Too many of their competitors' events make you feel like all the content is stringently policed and controlled with constant "rah rah" cheerleading of the provider's performance. With BPO, we are dealing with real people, real business issues and real processes; clients today are too smart to be brainwashed and want to have the open, honest debate regarding how to get better at managing a BPO engagement. Strong leverage with IT clients. It has leveraged its existing client base on the technology side with more than 60% of the existing BPO accounts also being relationships on the technology side. At the same time, it has been able to drive new business with its dedicated sales team opening several new annuity BPO relationships and using that as a hook to cross-sell and up-sell other Infosys offerings. Strong vertical process performance. It has focused, over the last couple of years, on expanding its offerings which impact the direct costs of their clients and, hence, the gross margin line as well as impacting revenue of its end customers. Revenue from these vertically-focused offerings today give Infosys BPO more than 35% of its total business, which is significantly higher compared to the rest of the industry, which focuses most of its energy and resources on horizontal BPO offerings. Focus on business platforms. InfyBPO has focused its energies on converging operations and technology to drive a multiplier effect for its clients which goes far beyond Six Sigma and continuous process improvement. Its heritage in technology has allowed it to lead leveraging Business Platforms (branded as InfosysEdge for different vertical and horizontal areas with 14 platforms actively in the marketplace) as well launch several Technology Value Accelerators (TVAs). Today, Infosys has more than 100 such TVAs in the marketplace in different vertical and horizontal markets. Today, all technology led BPO revenue constitutes more than 20% of the business and is steadily growing in contribution. Global expansion is broadening its growth potential. InfyBPO has also been able to create a true global organization with local leadership in each of its centers – for example, its Brazilian operations are led by a local Brazilian, its Mexican operations are led by a local Mexican, its Polish operations are led by a local, as well as its Chinese and Philippines operations. Speed of response and a high degree of customer centricity. With InfyBPO being a subsidiary of the Infosys mothership, it has provided its clients access to executive management, unlike its parent organization which has been a lot slower off the blocks. Having its key senior leadership (Ritesh Idnani - Chief Operating Officer; Gautam Thakkar – Global Head, F & A and Suranjan Pramanik – Global Head, Manufacturing) highly visible in the marketplace - and always available for a beer - is a huge plus compared to some of the other providers. Ability to continue differentiation in a rapidly evolving marketplace. For now, Infosys’ bet on leveraging technology to drive efficiency and effectiveness in their BPO business is paying dividends and they do have an early-mover advantage here. However, the rest of the pack is aggressively pursuing similar game-plans and it is going to require a lot of continued investment and focus to stay in front. Ensuring client expectations around transformation and innovation are suitably calibrated. Gone are the days of labor arbitrage and process improvement - that's now tablestakes for BPO. InfyBPO does seem to have taken some relevant steps here with the constitution of an Innovation and Transformation Board for its clients, which helps drive the transformation agenda in a focused and structured manner, however, several of its competitors also have similar iniatives in play with their clients. Placing BPO at the forefront of the executive Infosys corporate agenda. BPO only represents 8% of the Infosys business today, but is one of the key growth engines and still an investment business rather than a mature business. 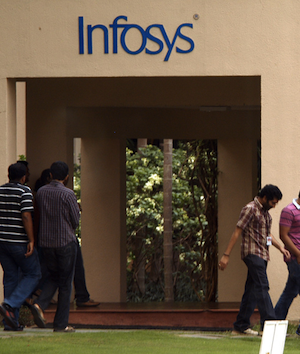 Will it be able to get a significant mindshare in the overall Infosys enterprise to garner investments? Will it receive the sales, marketing and investment attention it needs to hit $1 billion in the medium term? Bear in mind that Capgemini recently elevated BPO to one its top tier service lines, while Accenture often leads with BPO at its corporate events. In addition, IBM has recently appointed a true services veteran, Ginni Rometty as CEO, a known proponent for growing IBM business process market share. Over-ambitious profit expectations at the expense of growth re-investments. 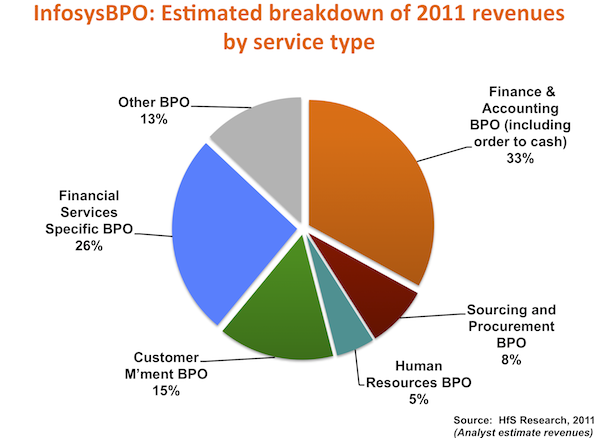 The InfyBPO business still has higher profits compared to most of the BPO sector. Worryingly, Infosys lost marketshare in the IT services side in 2008, when its other competitors like Accenture, TCS and Cognizant went after growth while maintaining margins in a lower band. Infy’s BPO business could get similarly trapped if it continues to want significantly higher margins than the rest of the sector and not be prepared to make strategic bets in areasit wants to grow (such as TCS' recent margin-gamble to win the Friends Life insurance deal). Being over-tentative with its cash investments to develop capabilities. Infosys needs to leverage its cash chest more aggressively as competitors are fast either plugging capability gaps or gaining advantages in markets on the BPO side (such as EXL's recent acquisition of OPI, Genpact with Headstrong, Accenture with Ariba services, Cognizant with CoreLogic and Capgemini with VWA). Given the greater stickiness of relationships on the BPO side, this will be a critical component for continued success to avoid its competitors gaining scale. Attrition and availability of talent. These are common industry challenges and cannot be overlooked, especially in the current environment where quality client executive leaders in BPO are becoming scarce. InfyBPO does seem to have taken steps here to arrest attrition and keep it below industry averages, however, it does have some high-performing client executives it needs to ensure are firmly on the train for the future journey. Infosys has been tardy in its acquisitions although its BPO business has been a lot more progressive with 2 acquisitions in the last 4 years. It acquired Philips’s shared services center in 2007, which has now more than doubled in revenue since acquisition. It made a foray in the insurance marketplace with the acquisition of McCamish, in December 2009, which instantly gave it a leadership position in the life and annuities insurance market. The McCamish business has grown more than 40% since acquisition and the pipeline has quadrupled in the last 22 months. With such proven success with its two previous acquisitions, HfS is surprised Infy hasn't been more aggressive with making additional investments in new capabilities to augment its market position even further. The market for acquisitions has been hotting up with several of Infosys’s competitors being aggressive in fueling inorganic growth to compensate for their lack of organic growth in the marketplace, such as the examples we mentioned above. Infy will need to look at bolstering its footprint in the following areas – healthcare, utilities, gaining more scale in traditional sourcing, onshore collections etc to ensure it can grows its business beyond $1 billion over the next few years. With its strong position in insurance, for example, it could take a serious look at insurance BPO provider EXL service to cement its position in the sector. Such investments do not come cheap, and will require some bold management decisions in the coming months, if they are to stave off aggressive competitive behavior. Having been witness to this organization growing from practically nothing to half-a-billion on barely five years, you can only praise InfyBPO and its leadership for a great achievement. One constant tireless figure that deserves a mention has been COO Ritesh Idnani, who has been integral to the division's development over this period. However, the challenge for InfyBPO now is not only to go after the traditional western providers, such as Accenture, Capgemini and IBM, but also to stave off the canny moves we are seeing from the likes of Cognizant and TCS. The speed of development of the competition to develop business platforms and secure new capabilities can change the market outlook very, very quickly indeed, and those who rest on their laurels will get left behind very quickly. The Infosys corporate mothership needs to start viewing its BPO division as a critical avenue for future growth and plan strategic investments that may involve some margin sacrifices. By creating a separate operating entity has been smart, but the time is now upon us, where InfyBPO needs more focus than ever from its corporate benefactor. HfS Research analysts attended Infosys Colloquium 2011 to hear how Infosys BPO is working with its clients. Over 150 attendees (clients, partners, analysts and Infosys employees) came together to share perspectives, learn from customers and understand Infosys’s BPO capabilities and new investments. HfS analysts Phil Fersht, Keith Strodtman, and Robert McNeill attended and joined customer panels. I wish other research firms could share such excellent insights like you guys do. I learned more about Infosys BPO in 15 minutes than the last 5 years reading this. Now you know why Infosys is materially trailing TCS and Cognizant in revenue and profit growth... because of their larger focus on F&A, Procurment and HR deals in BPO and not the vertically integrated and domain-led deals. Going by the Infosys CEO's comment in the last two days, looks like they will come in at the lower end of their tepid guidance for this year. In that case, TCS and Cognizant be growing at least 10-15 percentage points higher than Infosys this year. Doing just F&A, Procurement and HR work does not get a company anywhere. Also I was suprised to see this article calling out Infosys' Insurance practice to be "strong". If anything, that practice has seen lacklustre growth for well over a decade (despite McCamish). If one looks at Infosys' Insurance revenue (including health insurance), it's in mid single digits. Compare that with Cognizant which gets one-third of its BFSI revenues from Insurance (Life, P&C and Re-Insurance) and one half of its Healthcare revenue from Health Insurance. On an apple of apple basis, if Infosys gets $500 million from Insurance a year, Cognizant gets $2500 million (or 2.5 billion) from Insurance. And TCS also gets a similar revenue as Cognizant (not including the Friends Life business they won recently). You're completely confusing BPO and ITO here and are using the ITO performances of both Cognizant and TCS to counter our evaluation of InfosysBPO's performance. Cognizant has pursued a highly-successful application services model by structuring its sales and leaderships teams by vertical markets, which (arguably) has restricted its early growth in BPO. It has developed most its BPO business via acquisitions (UBS captive and CoreLogic) and not made an aggressive "horizontal" play. The market leaders IBM and Accenture have largely attacked the market by winning horizontal deals (eg F&A and Procurement) and can now add vertical competency to bid on vertical BPO deals with a lot of scale and global depth to support new client investments. Cog's challenge now is to get a structured balance of both horizontal and vertical business in BPO to grow it from its current size, which is half of Infosys' BPO business and a quarter of that of TCS'. And the lion's share of Cog's insurance revenue is ITO business, not BPO. Great article. It gives you inside in the issues BPO brings to the table. What research. Great article Phil. Points around organic growth makes lot of sense but as you said correctly the crucial time starts now. We need to understand where we want to be as a BPO firm, at $1Billion or beyond. There is, ofc.ourse, a world beyond BFSI and CS.